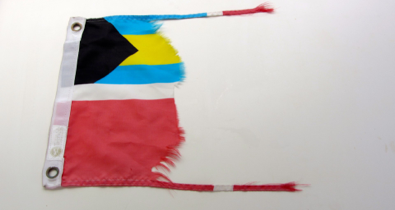 The last time we were in the Bahamas our Bahamas courtesy flag looked similar to the photo above after five months. This time, with help from the constant strong winds this season, it took three months to get in this condition. However, we learned from our mistake last time and brought two flags with us this year. A new one went up today and hopefully will not look like this one after two more months. We also learned that you can buy a better quality courtesy flag from Bluewater Books either online or at their Ft. Lauderdale store. In preparation for leaving this coming weekend, we moved over to Kidd Cove today. While we can make our own RO (reverse osmosis) water with our watermaker, RO water is free to cruisers here, compliments of Exuma Market. You simply bring your dinghy to their dock, get in line with others and fill your water jugs from a hose. We decided to take advantage of this and fill our tanks today with this free water. On a sunny day our solar panels keep up with our watermaker, but this limits what else we can do with available power. Mark has made several trips to the dinghy dock with our two 6 gallon water jugs. The tanks were not empty, so it didn’t take long to fill all three tanks. We are also getting diesel to top off our two fuel tanks. We can get fuel along the way, but it’s nice to start off with everything full. Mark is also getting that in jugs and pouring it through a filter into the tanks. Once all the tanks are full, we’ll pull up the anchor and head over to Monument. Last night the incoming tide in our anchorage at Black Rock Point was competing with the wind and we were rocking from side to side. It wasn’t totally uncomfortable, but should be calmer in Monument. We are trying to think of everything we need to do in Georgetown before we leave for smaller islands and cays, which won’t have these facilities. We still have lots of food but will pick up some fresh fruit and vegetables from Exuma Market. We won’t see another grocery store this large until we get to Eleuthera. We also won’t have this good Internet access for awhile, so I’ve taken advantage of it to upload several blog entries while we were here. We don’t have definite plans for the next two months, but do have to stop in Staniel Cay. I ordered a new battery for my Mac and also a 12V charger for the iPad. These will come via Watermaker Air in Ft. Lauderdale along with our mail from the last few months. The computer works plugged in with a 12V charger without a battery but is slow and it takes too much voltage to charge computers and phones through 110 outlets, so we now will have 12V chargers for everything. It probably would have been a better idea to get them before we left to States, but since it’s so easy to send packages to Staniel Cay, it wasn’t much more expensive to do it this way.